Margaret Astrid Lindholm Ogden writes fantasy fiction under the pen name Robin Hobb. She also writes contemporary fiction as Megan Lindholm. Hobb is most famous for her novels set in The Realm of the Elderlings, including The Farseer Trilogy, The Liveship Traders Trilogy, The Tawny Man Trilogy, and, most recently, The Rain Wilds Chronicles. The Dragon Keeper is the first book of The Rain Wilds Chronicles. She is currently working on an untitled book which will include some of the characters from The Rain Wilds Chronicles. Guided by the dragon Tintaglia, they came from the sea: a Tangle of serpents fighting their way up the Rain Wild River, the first to make the perilous journey in generations. For Thymara, a Rainwilder born with scales and caws, the return of dragons symbolises the return of hope to her war-torn world. Leftrin, captain of the liveship Tarman, also has an interest in the hatching; as does Bingtown newlywed, Alise Finbok, who has made it her life’s work to study dragons. As usual, Hobb’s characterisation is absolutely flawless in this novel. The story is primarily told through Sintara, a dragon who cannot fly, and Thymara, a Rain Wilds girl who was allowed to survive despite being born with scales and claws. Interspersed are the view points of Alisa, a Trader-born woman in an unhappy marriage, her childhood friend Sedric, and the captain who is ferrying them on the Rain Wilds River, Leftrin. These characters are so wonderfully described that I never dreaded a change in point-of-view. I feel that they grew in predictable ways through the course of the story, and the only negative point is that I was never surprised by any of the major developments in the novel. I have always found Hobb’s level of world-building impressive, and this book did not disappoint. The descriptions were vivid and rich in detail and I absolutely loved it. The story is mainly set in the river valley that used to be the dragon’s breeding ground, where the dragons have not visited for generations, and has become swampland, marsh and rain forest in the intervening years. Humans live in the trees and have discovered ruined Elderling cities, but they do not understand the things they find there. The level of thought into the ecology of a world is rarely seen in fantastic literature, and makes this book a thought provoking read. The most annoying aspect of the novel is that it it does not have a conclusion. The story is set up very slowly and the journey of the dragons and their keepers only begins half way through the book. The novel is paced as though it is a much larger book, and comes to an abrupt halt. The lack of conflict (and its subsequent resolution) left me disappointed. I would suggest that this book should not be read unless its sequel is close at hand. 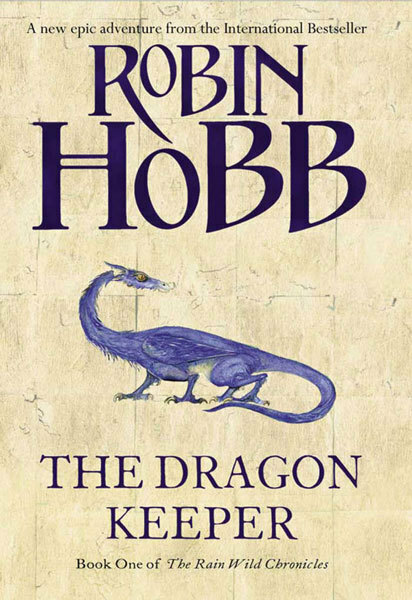 A great story with amazing characters you can not help but sympathise with, The Dragon Keeper continues Robin Hobb’s amazing work in fantastic literature. I suspect this novel would be unsatisfying if the sequel is not read soon after, however the exploration of human nature and its place in the wider world will entertain many readers. If you loved Hobb’s other works, then this is a must for you, and if you have not, then it would be best if you started with The Farseer Trilogy and work your way through the novels of The Realm of the Elderlings.